Find My Workspace lists over 95% of the serviced offices market in Eight Mile Plains. Simply click Request Quote to check pricing for one office, or Add to Basket for multiple offices. This office building on Brandl St is a highly presentable modern development popular with businesses seeking highly presentable office space, ranging from 30m² – 250m², available for immediate lease on flexible terms. Smartly fitted out the offices have an open plan layout, with larger suites having the additional bonus of one partitioned room suitable for use as an executive office or meeting room, while smaller offices may be furnished on request. A separate kitchen area is also provided. All offices are pre-cabled with CAT 6 network cabling enabling you to move in and start operating with minimal disruption to business. An on-site coffee shop, meeting room and other break-out spaces provide additional space to host meetings and welcome visitors. 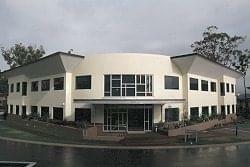 This modern, free-standing building has an office park setting with plenty of on-premise parking available, at a prestigious address in the comfortable suburb of Eight Mile Plains. All of the executive serviced offices in this space are of premium ‘A’ grade quality and boast a modern layout with the latest technology including high-speed Internet access, state of the art photocopying machines and conference facilities. Take advantage of the on-site reception staff, who are happy to assist you with whatever you need, whether it’s answering the phone on your behalf or taking in your mail while you’re in meetings. To obtain information for your selected Eight Mile Plains Serviced Offices, please tick the "Add to basket" box for each office you prefer and complete the form below. We will then send a detailed report via email.